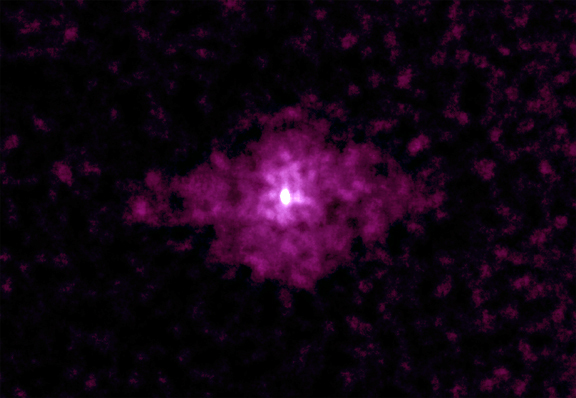 Chandra's image of 3C58, the remains of a supernova observed on Earth in 1181 AD, shows a rapidly rotating neutron star embedded in a cloud of high-energy particles. The data revealed that the neutron star, or pulsar, is rotating about 15 times a second, and is slowing down at the rate of about 10 microseconds per year. 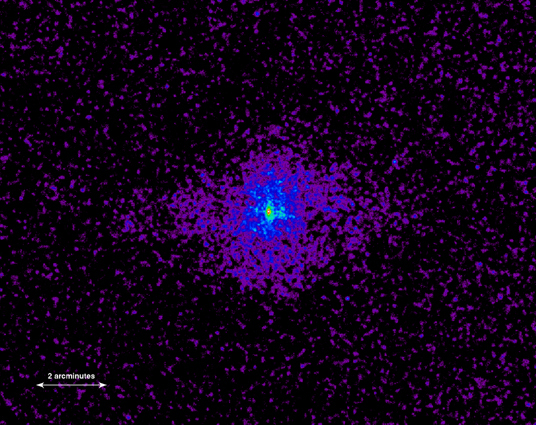 A comparison of the rate at which the pulsar is slowing down and its age indicate that the 3C58 pulsar, one of the youngest known pulsars, is rotating just about as fast now as when it was formed. This is in contrast to the Crab pulsar, which was formed spinning much more rapidly and has slowed to about half its initial speed. Furthermore, the total X-ray luminosity of the 3C58 pulsar and its surrounding nebula is a thousand times weaker than that of the Crab and its surrounding nebula. Scientists hope that further study of the similarities and differences in the behavior of these two pulsars, which are approximately the same ages, will shed light on the process by which they are formed, and how they pump energy into space for thousands of years after the explosion.